This first month has been unbelievably wonderful with you. You are the sweetest, most cuddly baby and I have been soaking it up! In fact, for your first three weeks, I hardly ever put you down. You love to curl up on my chest and go to sleep (I think you enjoy hearing my heartbeat as you did in the womb). I have to say it is the best feeling in the world. I could happily let you sit there forever breathing in your sweet new baby smell. I lovingly refer to you as my little kitty cat. Your fourth week was my first alone with just you and your brother and there were some major adjustments. I couldn't hold you every moment or go to you at your first cry, but you are a surprisingly patient baby. It breaks my heart that I can't always give you my undivided attention, but when it is just me and you...I make sure to spoil you as much as I can. Just like your brother, you have been growing a little slower than expected. You dropped an entire pound before we left the hospital and were 3oz short of regaining your birth weight at your 2 week appointment. By your one month appointment you were weighing in at 9lbs 4oz and holding steady at 21in in length. 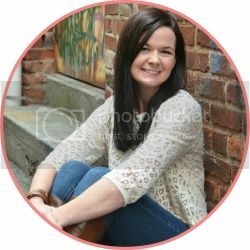 Clothing-wise you have already grown out of most of your newborn clothes and are now comfortably wearing 0-3 month sizes. I can't believe I am already packing away the precious newborn outfits. Your brother was in them through month 2! Sleep has really been a non-issue for you. 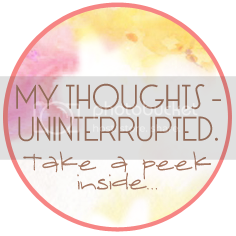 Sometimes it is a little difficult to get you down initially although I think most of that has to do with some tummy issues that we are in the process of getting straightened out. Otherwise, I think you are a fantastic sleeper. You aren't really on a solid nap schedule yet, but when you do nap you can amazingly sleep through practically anything. Our house is very noisy these days and most of the time you don't even wake when your brother decides to poke on you and practically smother you with his 2 year old bear hugs. At night you fall asleep after your 11PM feeding and sleep until about 4 or 5AM...seriously...I can't tell you how much I appreciate the long stretches. Every now and then you will wake up for a snack around 2AM, but usually you fall right to sleep as you nurse and sometimes....shhh....I let you just sleep right there cuddled up by my side. This first month is going to be mighty hard to beat, but I know there is much more fun, excitement and sweetness to come. While I'm not rushing it...I am looking forward to it. oh my gosh! 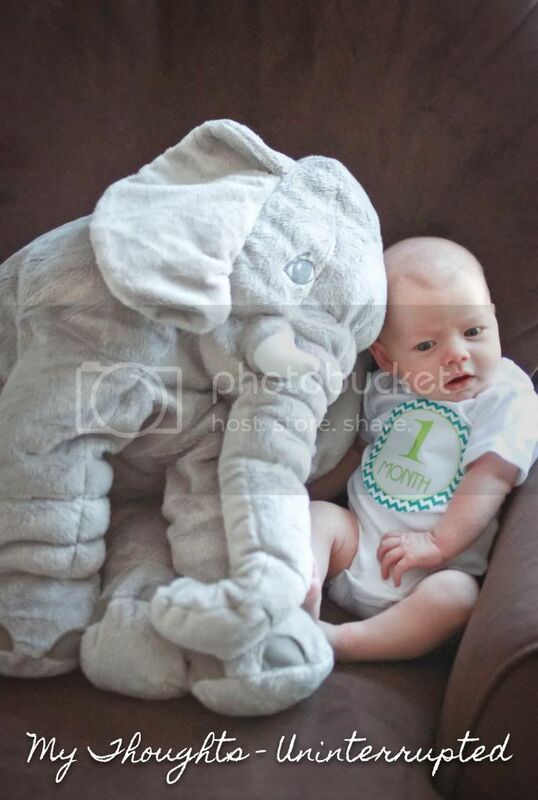 How is it possible that this little cutie is already a month old?!?! Wow, time flies! He is so handsome! Love the screaming picture and picture with the elephant. Yes! Our sleeping schedules sound very similar. The long stretches are wonderful...the only downfall is not getting the second stretch because of the toddler being bright eyed and bushy tailed at 6:30! 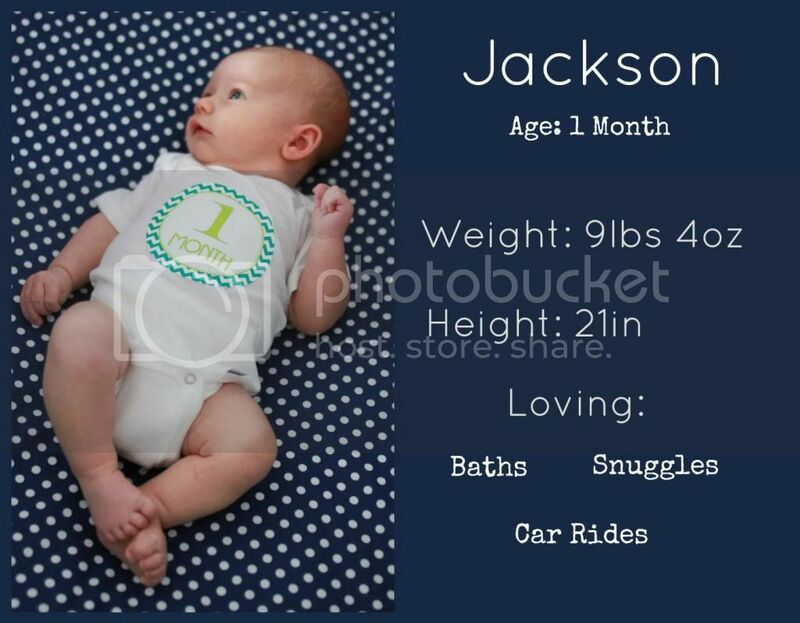 Sounds like Jackson is a wonderful baby and SO stinking adorable. 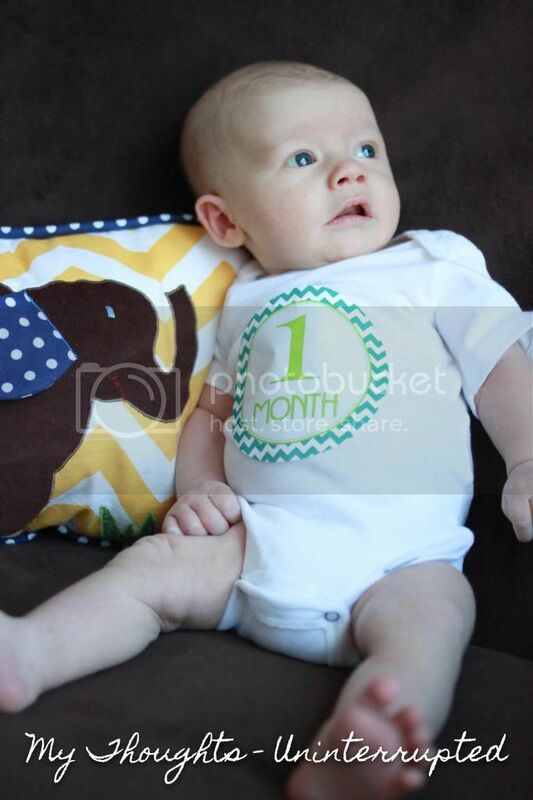 Happy 1 month little guy! Baby cuddles are the best. 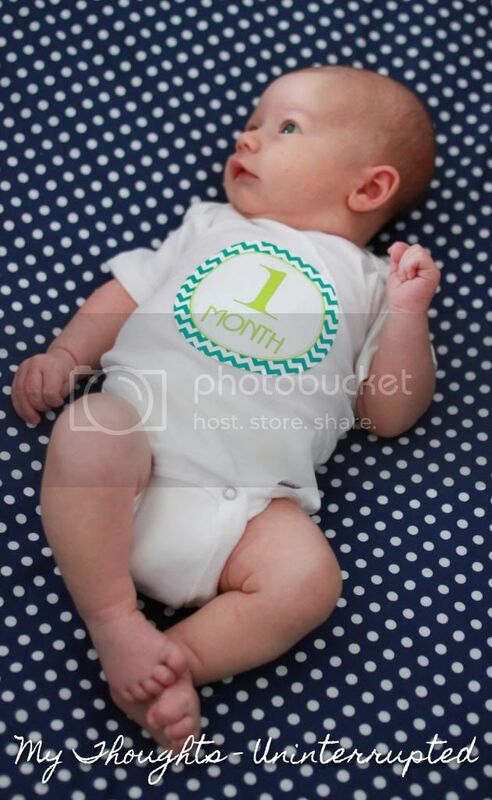 Happy one month to your cutie! 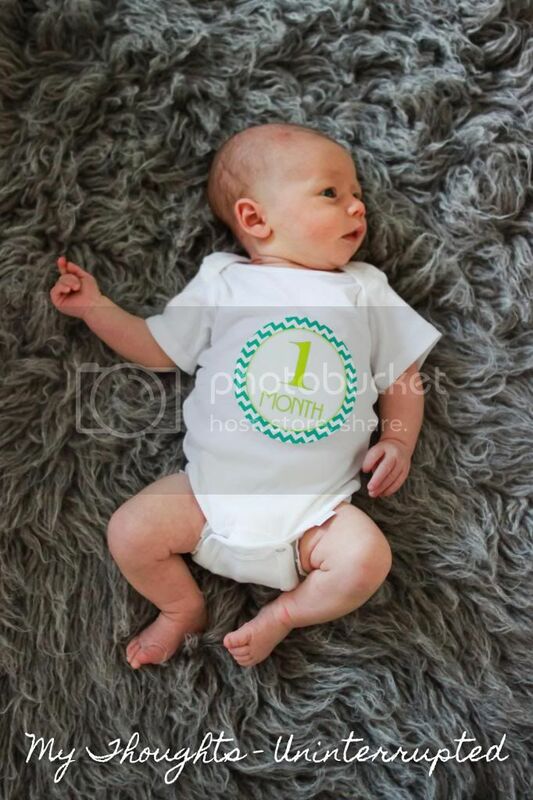 how on earth is your baby a month old already?!!? !